The Mark Twain Lake encompasses approximately 55,000 acres of land and water available for fishing, hunting, camping, and other recreational opportunities. At normal pool the Lake covers about 18,600 acres and has approximately 285 miles of shoreline. 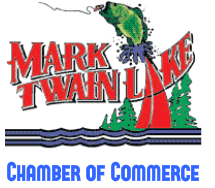 While the Lake offers numerous outdoor recreational opportunities for visitors of all ages, the Chamber of Commerce businesses seek to provide those visitors with all the amenities possible for a relaxing and enjoyable visit to the Lake area. For more information about the motorcycle safety class please go to our Events page or click here for a registration brochure.